Not to be confused with Ministry of National Defense (Republic of China). 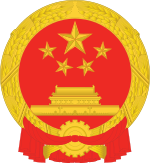 The Ministry of National Defence of the People's Republic of China (simplified Chinese: 中华人民共和国国防部; traditional Chinese: 中華人民共和國國防部; pinyin: Zhōnghuá Rénmín Gònghéguó Guófángbù) or for short the "National Defence Ministry" (simplified Chinese: 国防部; traditional Chinese: 國防部; pinyin: Guófángbù) is the 2nd-ranked ministry under the State Council. It is headed by the Minister of National Defence. The MND was set up according to a decision adopted by the 1st Session of the 1st National People's Congress in 1954. In contrast to practice in other nations, the MND does not exercise command authority over the People's Liberation Army (PLA), which is instead subordinate to the Central Military Commission (CMC). Instead, the MND itself only serves as liaison body representing the CMC and PLA when dealing with foreign militaries in military exchange and cooperation. Its official responsibilities had been to exercise unified administration over the development of the armed forces of the country such as recruitment, organization, equipment, training, scientific military research of the People's Liberation Army (PLA) and the ranking and remuneration of the officers and servicemen. However, in reality these responsibilities are carried out by the CMC's 15 departments. The Ministry of National Defence General Office is in fact the same body as the General Staff Department General Office. Other offices are also staffed by personnel from the General Staff Department. Although the Ministry itself does not exercise much authority, the role of the Minister of National Defence has always been viewed as one of the most important positions in the country’s political system. The Minister is always an active military officer, a State Councilor and a member of the Communist Party's Central Committee and member (sometimes a Vice Chairman) of the Central Military Commission, enabling him to take part in the decision making in the PLA, the Government and the Party. "Ministry of National Defence". SinoDefence.com. Archived from the original on 2007-11-09. Retrieved 2007-11-21.